Since Willis Carrier invented the modern air conditioner in 1902, his name has become synonymous with innovative home comfort products. At Swan, we are proud to install and service a full range of energy-efficient Carrier air conditioners. 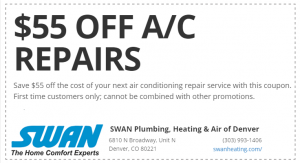 There are a number of reasons why Swan has a reputation as one of the best air conditioning service companies in Denver and the surrounding area. We will always give you a written estimate so that you will know exactly how much it will cost to repair your Carrier AC unit. With Swan, you never have to worry about hidden fees or costs. If repairing your AC is not feasible, our technician will provide you with replacement options. All of our repairs and installations come with a warranty on both the parts and labor. Or, click here to schedule your Carrier air conditioning service online. We service and install all of Carrier’s Infinity®, Performance™, and Comfort™ Series air conditioners. The units are compact, quiet, reliable, and efficient. Do you have an older model Carrier AC unit that isn’t on the list? Don’t worry, we service old models as well, just give us a call and let us know what you’re working with! Why Install a New Carrier Air Conditioner? A new, energy-efficient Carrier air conditioning system is ideal if you are building a new home or if you are remodeling to create additional living space. If your current AC is in constant need of repairs or is not keeping your home comfortable enough, we can help you find the right Carrier air conditioner for your home. Carrier, like most top manufacturers, offers air conditioner models rated as “good,” “better,” and “best.” This makes it easier for us to customize a home comfort solution to your needs and budget. The following is a guide to what these different options offer. Good: This is the most popular option when the upfront price is a major concern. You get average efficiency and performance at the lowest cost. This type of unit is best suited for spaces that are not heavily used. Better: Units rated at “better” offer single or two-stage cooling and are Energy Star efficient. These units are the most popular among homeowners in Denver and the surrounding area. They provide a good balance between price, performance, and efficiency. Best: These are the most energy-efficient units available. They offer two-stage as well as variable-capacity cooling options, which make them an excellent choice when comfort is a top priority. Of course, this increased efficiency and performance comes with a higher price tag. If you are considering upgrading your current AC system, our professionals will help you determine the best size and model for your budget. We are happy to prepare a written estimate for installing a new Carrier air conditioning system in your home. Diagnosing your air conditioner problem is just the first step in determining if you should repair or replace your existing unit. Many homeowners choosing to replace their existing AC opt for a new Carrier unit. In addition to their superior quality, Carrier also offers some of the industry’s best warranties. If a new air conditioner is your best option, we will recommend a replacement that is the correct size. In many cases, we find that the existing AC unit is either too big or too small to meet the home’s cooling demands. This is especially true if there have been additions or other modifications made to the home. An improperly sized air conditioner will result in higher utility bills and will not control the temperature and humidity in your home. At Swan, your family’s comfort is our top priority. Call us today or use our convenient online request form to schedule an in-home estimate.